2012.09.08 [굿아이디어] 구글의 무인자동차, 가격은 페라리 한 대 값? [굿아이디어] 구글의 무인자동차, 가격은 페라리 한 대 값? 구글의 무인자동차, 가격은 페라리 한 대 값? 구글이 야심차게 개발하고 있는 무인 자동차, 즉 스스로 운전하는 자동차가 현실에 나타나게 되는 모양이다. 충분한 테스트를 거쳤고, 구글이 소재한 캘리포니아에서는 이 무인 자동차의 도로주행을 합법화하는 법안이 캘리포니아 의회를 통과하였다. 그러나 정작 일반화되기에는 큰 걸림돌이 있다. 엄청난 수의 센서과 제어관련 부품들을 필요로 하기 때문이다. 그 추가 부품의 가격만 해도 $250,000. 렉서스 RX450에 장착하면 총 가격은 30만불을 넘어서게 된다. 무인 자동차의 상용화는 이제 가격이라는 문턱만 남았다. 센서와 관련 하드웨어의 가격을 낮추는 것은 시간이 해결할 것으로 보인다. 그리고 또 한가지 중요한 변수는 보험이다. 보험회사가 여하한 조건으로 보험인수를 할 것인가? 여하튼 우리는 머잖아 운전석에 사람이 비어있는 차가 도로를 질주하는 모습을 보게 될 것이다. 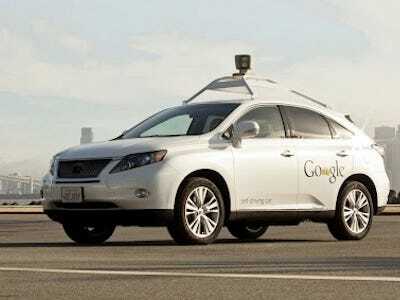 그런 차를 만나면 기분이 묘할 것 같은데..
Google has made stunning progress on the self-driving car project it launched two years ago. Last month, it announced that its fleet of cars—a dozen or so on the road at any time—had logged 300,000 miles. And California's Senate just approved a bill to legalize self-driving cars in Google's home state. But despite that progress, a true self-driving car is far from hitting the market. That's because, according to a well-informed startup founder working on similar technology, the massive array of sensors Google has to install in its cars alone costs $250,000 or more. Add that to the $45,000 retail price of the Lexus RX450h cars it's modifying, add in some other custom components, and you get a car that costs more than $300,000. It makes the Tesla Model S look like an affordable luxury. Google will not disclose the cost of its self-driving car project, or any of its other far-out research and development efforts, a spokesperson told us. It has always characterized self-driving cars as a small side bet. And it's true: Even if Google is spending millions of dollars—at least $3.6 million just on its current fleet of cars, never mind the engineering salaries—that's a drop in the bucket compared to its overall revenues. But if Google intends to take this technology to the mainstream, as seems to be its ambition, it must reduce the cost of its sensors. Leverage Motorola Mobility's engineering experience. Google just added a lot of hardware experience with its acquisition of Motorola—remember, that company got its start making car radios. Use cheaper sensors. The startup founder we spoke to said that once Google got its data-processing algorithms right, it could rely on less-sensitive sensors and use sheer computing power to make up for their lower accuracy. Get subsidies from insurance companies. Anthony Levandowski, Google's business lead for the car project, said earlier this year at an automotive-engineering conference that the company is talking to insurers about whether self-driving cars could get lower rates.